Honestly speaking it really did not matter to me what decision was about to come, whether a mandir was to be built or a mazjid did not really bother me. It bothered those who had legitimate insecurities of their existence dependent on the disputed land. What bothered me more was how long are we going to keep getting bothered or scared about these kind of things ?? Even as 2000 AD started which was termed as the so called "21st century.." Digital era , E era and so on. We witnessed how a powerful democracy of the world America voted on religious fundementals namely rejected the concept that they had then termed as "Islamic Terrorism" , 10 years down the line... going back on their words they chose to undo the damage they have already done to the world... by building a mosque on Ground Zero. Unfortunately they have already pushed several thousands of young lads into the deep grave of terrorism, which then to these young lads was the only way to save their identity of religion. Things have not changed from long 2000 years back or to say 5000 years back ( or even older) when our religious books or religion came into existence, needs were limited to a few several things namely food, clothing, money and faith seemed the only way of connecting to the good within us. So that we can know our purpose of living is to derive the content of happiness from within and not outside. But eventually our age old habit of forcing our beliefs on everyone else overshadowed it. It was still on a bearable edge until came the time when our faiths took shapes of concrete on the face of earth. Prayer houses, faith buildings turned into gatherings of people who had same belief system and each believer used his own way to expand his belief into others. Nobody knows why suddenly people of different faiths started to worry about expanding their faith or who started expanding it first or whether it was forced or amiable but what comes sure into this picture is that who ever did this did it only for one reason and that was "Identity Crisis". Most often when people meet or greet you and start talking about themselves, they begin by identifying themselves to you "name" is one such thing. Queerly each of our names which could have been a mere identification turned into an identity when attached to our faith. Our "Names" "Surnames" "Village or Town" or "State" or somewhat forgotten these days "Lineage or Gotra" each of these things makes us what we are especially for those who have no other way to assert themselves in front of others. Today we identify Ratan Tata for TATA industries or Dhirubhai Ambani for Reliance industries or Subhash Chandra Bose and Bhagat Singh for their valour as Freedom fighters...do we identify them for being only Parsi or Gujrati or Bengali or Punjabi ?? Many don't but also Many do. World over people are being subjected through a phase where they are being churned for their identity, where people are craving for being accepted by the larger lot. People want to know what they have in superiority that can be a part of their identity too even if they do not have a pint of their trait in themselves. Dress, fashion, style, latest gadgets etc are merely a superficial part of that same identity crisis of which religion, faith , customs, traditions are an abstruse part. We tend to cling to our identity for being appreciated, for being recognized and for being understood. Identity crisis is an excuse we use for our lack of courage to pursue and achieve something. Even a small thing like "I am a girl I expect some sympathy." is as much a lack of courage as much is " He lives in a metro obviously he would do better." every now and then you would find people grouping themselves into something for AN EXCUSE. An excuse to do away from a job, to keep failure at a bay, to hold someone else responsible for their failure so on and so forth. 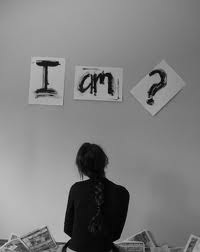 Identity crisis can be solved but first and foremost it needs a will, a dare that none of us yet have. We have chosen an easier path by solving through fists and hits than resolving through minds and spirits. Religion and faith were build to bring us out of a problem to serve as a solution to give away identities to God and live lives as only human beings. But it is amusing thing to see that it is thy our faiths that has brought us to the same door of problems where we had once begun from. P.S May be next time i would come up with something lighter. Till then bear with my serious mode. Nice Post and Religion undoubtedly resolves confusion and try to serve as a bridge in filling voids and attaining inner peace. At times I muse if an Atheist went into identity crisis what will be his/her motivation to move ahead ? Identity crisis begins from the time we lose faith on ourselves our understanding and need collective faith of larger number of people to move ahead. Rather it is the religions all over the world that need faith and hope. Faith of being cherished by people in future and Hope of survival in future. Religions which are self sufficient in these two things will never force itself on others. Hi Shreya, How are you doing? You will see the results in a week. But be regular with it. I bathe with it for almost 1 and a half years. the changes it brought to my skin never turned back to the old one. Just make it your habit.